With the advent of the 5G era in China this year, the rollout of massive networks is underway and 5G pre-commercial trials will begin in the second half of the year. A portion of users will likely try out 5G services some time in 2019. Media attention has also been drawn to 5G at fever pitch. "China is expected to gear up for its conceptual development and trials of 6G as early as 2020 in a bid to lay out policy brush strokes and its own sets of definitions and standards," Asia Times said in a recent article. Unrivaled fluidity and ultra-fast transmission offered by 6G will be 10 times faster than that enabled by 5G, per the article. This has left an impression in the public that 6G deployments have already begun in China and some people even reckon that China is leading the world on 6G. Miao Wei, minister of Industry and Information Technology, has also revealed the country's plans to begin 6G research. Nonetheless, I would argue that 6G is still a long way from becoming a reality. Universally adopted telecommunications standards are a must for mobile communications technologies factoring in the need for roaming services across the globe, therefore a lengthy period of negotiation is required before the new-gen telecommunications technologies kick in. Normally, each country's telecom companies would come up with their own visions and then talks would be held to reach a consensus. Companies would then start researching technologies in accordance with the agreed vision and propose their technology standards. Those standards are meant to be played off against each other with a consensus being found on what improvements can be made to the eventual winning standards. And the standards finally chosen will still be submitted to the International Telecommunication Union for a vote. Only after the standards are approved at the ballot box, the next-gen mobile telecommunications standards will be ultimately established. In the 2G and 3G eras, production for devices didn't begin until the standards were approved, and one to two years after that the deployment of networks was started. When 4G came out, technologies became more mature. As a consequence, some countries started researching and manufacturing devices and even began network deployments before technological standards won formal approval. In any case, mobile telecommunications can't be pushed by a single country. 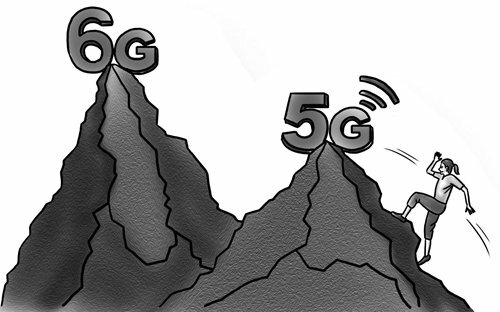 China's 6G push therefore ought to be aligned with global efforts. With 5G standards about to be approved and 5G networks set to be built on a large scale, it shouldn't be a surprise that research and development of 6G technology is now underway. The Chinese government, universities and businesses have been looking at 6G development. But that's just the beginning of a long journey into a 6G-powered world. It took roughly 10 years from 1969 to 1979 for the first-gen mobile telecommunications technology to progress toward early network deployments from initial research and development. The comprehensive build-out of 1G networks came even later. It wasn't until 10 years after that 2G mobile network came out, then it took another five years for 2G networks to unfold. It became much quicker after the arrival of 4G. China only issued 3G licenses in January 2009, and it's already about to embrace 5G in 2019. That said, the transition from 5G to the next-gen telecommunications technology will take longer than the shift from 3G to 4G that didn't involve disruptive changes in terms of devices. As 5G technology entails revolutionary changes, 5G-enabled devices and applications need to be created. As such, it still needs to be seen whether the country is poised to see a 5G application boom in the coming several years. In this sense, it might take longer for 5G to come to fruition, thereby downplaying hopes for the arrival of 6G in the near future. It's also the case that the country's beginning of research into 6G telecommunications technology, rather than indicative of any substantial 6G push, is much of an attempt to gather information in order to define its version of 6G visions. In a nutshell, the genuine advent of 6G remains a long way off and the primary goal today is still to bring 5G into daily life. And bear in mind: as China is just one member of the world family, the country won't take a unilateral lead on 6G development.